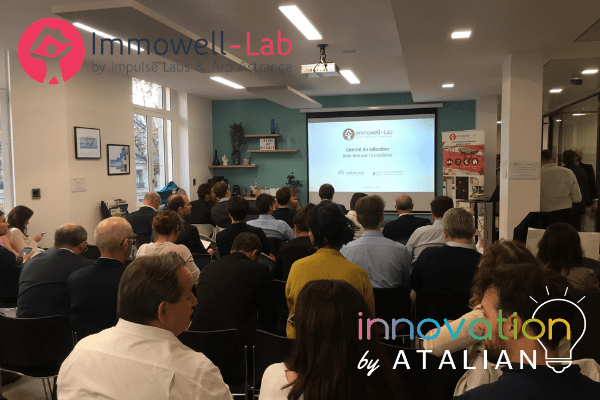 ATALIAN’s Innovation team was present at the end of September, at the 4th Immowell Lab 2018 selection Committee, organised by Impulse Partners and ARP Astrance. Immowell Lab, who we partnered with in June 2017, is a startup accelerator focused on well-being in the workplace. The challenge for ATALIAN is to position itself on new trends in the real estate and FM sectors and to discover new startups. Here is a brief overview of an evening marked by fast-paced presentations and highly motivated entrepreneurs. After a series of short but intense presentations of 7 minutes, the members of the committee voted for the start-ups that would join the incubator. This part was followed by a cocktail reception which gave the start-ups an opportunity to explain their projects in more detail and develop contacts with companies interested in their solutions. The next Immowell Lab committee will take place on the 22nd of November 2018.